ion interactive, the leading enterprise content marketing SaaS platform for interactive digital experiences, is pleased to announce that both its Florida and Massachusetts offices have relocated with room to grow. 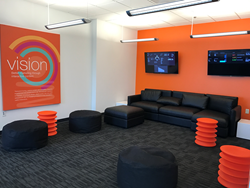 ion’s new HQ sports a playroom, a living room, a fully stocked café, a mother’s room, flex privacy spaces with sit/stand desks, piped in indie rock, the scent of freshly baked sugar cookies, live-streamed company dashboards and foosball. ion interactive, the leading enterprise SaaS platform for interactive content marketing, positioned itself for continued growth with moves into new offices in both Florida and Massachusetts. ion’s headquarters moved from its downtown location to Boca Raton, Florida’s park of commerce tech corridor. ion’s Massachusetts office also relocated within Cambridge. With the content marketing world accelerating its adoption of interactive content experiences, ion’s enterprise SaaS platform is uniquely positioned to provide brands and agencies with the foundation they need. Recent Content Marketing Institute research shows that 75% of content marketers are increasing their use of interactive content. And, according to that same CMI study, 81% of content marketers agree that interactive content grabs attention more effectively than static content. With 79% agreeing that interactivity enhances brand retention and results in repeat visits, interactive content is proven more effective across the board. “We are so excited to give our teams the space, resources and amenities they need to continue to innovate, market and sell our content marketing SaaS platform. Our new headquarters is over 30% larger, with bright, energetic spaces for our sales, marketing, operations, services and customer success teams. Our new Cambridge office gives our engineering and technical services teams a spectacular view of the river. All in all, we couldn't be happier with both moves.” said Justin Talerico, ion’s CEO and co-founder. The ion interactive enterprise SaaS platform empowers modern marketers to produce data-driven interactive content at scale and without code. ion’s marketing technology and services deliver measurable business value for hundreds of brands and agencies. ion’s platform launches, customizes and tests all types of engaging interactive digital experiences — infographics, ebooks, assessments, quizzes, lookbooks, interactive white papers, calculators, wizards and configurators. The platform delivers competitive differentiation, conversion performance and lead quality for in-house and agency teams. ion interactive is rated 4+ stars on TrustRadius, GetApp and G2crowd by hundreds of brands and agencies including Anthem, Dell, DHL, SAS, eHealth, Fiserv, Principal, HP, Key Bank, GE, FedEx, NetApp, Nielsen, Polycom, Salesforce, Symantec and UBM. ion interactive headquarters entrance graphic: Dream big. Have fun. Get it done.ion interactive headquarters entrance graphic: Dream big. Have fun. Get it done.